This is a contribution from a Sophisticated Gentleman. My brother-in-law enjoys cooking more than my sister does. This is one of the first dishes that he won her heart (through her picky stomach) with when they were dating. It is still one of her favorites. Don’t worry if it turns out differently every time. It is part of the charm of it all. It all comes together quickly, so I recommend prepping all the ingredients before you start cooking. I color-coded ingredients that can be mixed ahead of time so you just have to dump it all in at once. The bonus is you can taste it and see if you like it or want to adjust it before adding it in. Feel free to play around with the quantities. If you like more egg, add more. Like the black bean sauce, add more of that. If you’re not sure about how to adjust it, think about the individual ingredients – too salty, that is too much soy sauce, so add more black bean sauce. Black bean sauce is usually in the Asian section of the grocery store, or of course in Asian grocery stores. Before adding in the water/cornstarch mixture, make sure you give it a fresh stir because it tends to settle in clumps. In a medium bowl, dissolve ½ T cornstarch in the sherry. Add the shrimp to the bowl and toss to coat. Prep the rest of the ingredients if they are colored, put like colors together. Heat the wok or large skillet over medium-high heat. Add the shrimp and fry until pink, about 3-5 minutes, flipping them about halfway through. Remove the shrimp to a plate, leaving as much oil in the pan as possible. Add the garlic and ginger to the hot oil, fry for a few seconds. 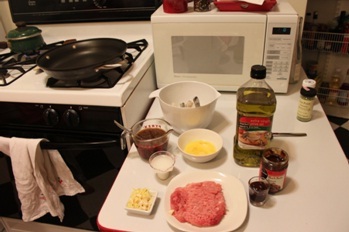 Then add the ground pork. Cook, stirring constantly until the pork is cooked and no longer pink. Combine broth, soy sauce, black bean sauce, sugar and salt in the wok with the pork. Bring to a boil. Reduce heat to medium and simmer for 2 minutes. Mix the remaining 1-1/2 T cornstarch with ¼ c cold water. Pour in the pan with the pork. Add back in the shrimp and any juices. Bring to a simmer and keep stirring. While stirring, drizzle in the egg and keep stirring until the egg gets mixed into everything as it cooks. Serve over rice. 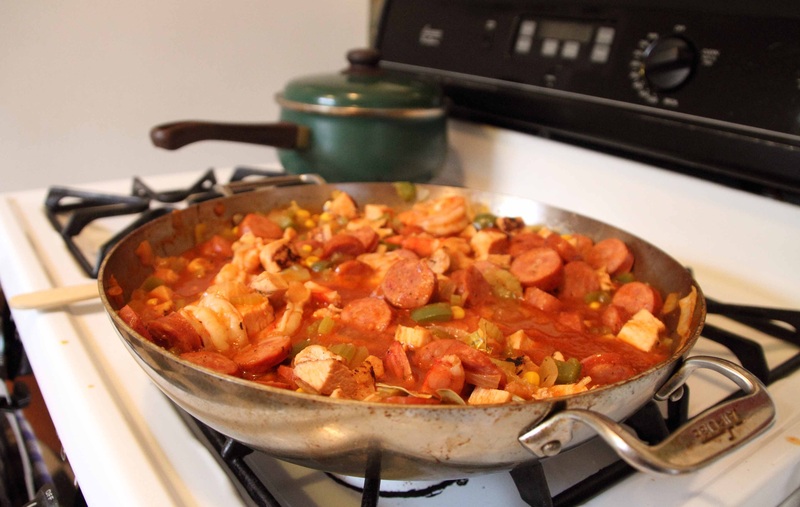 Are you looking for something that is PACKED with great flavors – Andoulle sausage, shrimp, chicken – that is super satisfying, impressive for guests, but also super easy to pull together? Well, here is one for you. It is a stew, but you serve it over rice, so it is an all-in-one meal in a bowl. This one is from our family friend, Lois. She is an amazing cook who has only given me amazing recipes. And lives up to her great reputation. The tomato stock can be made directly in the skillet, so you won’t even use too many dishes to make it. If you think of it, grill the chicken ahead of time when you’re making something else on the grill (or bake them if you don’t want to fire up the grill). You can add more veggies if you want and if you like it even thicker, just add more cornstarch-water mixture. It freezes well, and it is a great one for company because you can finish it ahead of time and then serve when you want. 2 pounds boneless, skinless chicken breast – grilled (I used about 4 frozen ones) – I sprinkled with Cajun seasoning before grilling. 1 small can of corn – or use fresh if you have it! Saute the celery, onion and peppers in large heavy skillet in olive oil. Cook until vegetables are half cooked. Add the chicken and Andoulle sausage and sauté for 5 minutes. If you are serving it right away, add in the shrimp at this point. Add in the tomato stock ingredients, simmer for 10 minutes or until you feel all is done. If it isn’t thick enough for your liking, mix up some more corn starch and water and mix it in. 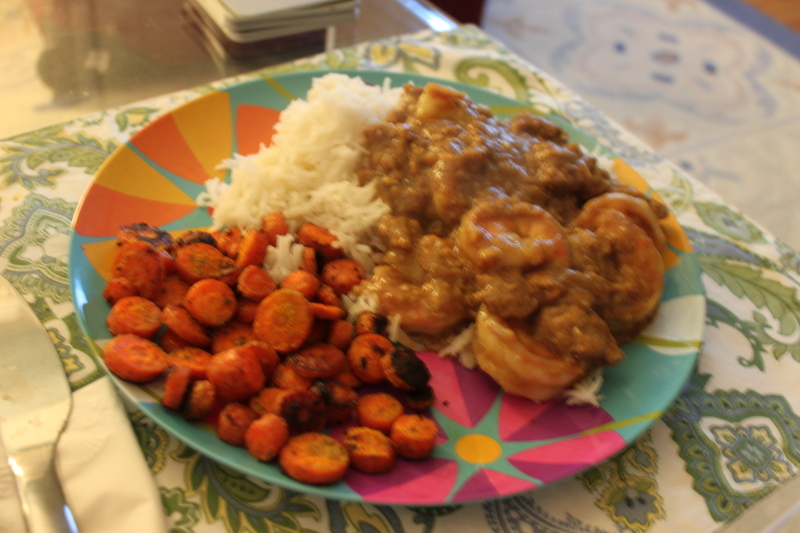 If you are serving later, add the shrimp in and heat over medium-high heat for about 7-10 min until the shrimp is cooked. Can freeze to serve later. If you want to look at pictures more closely, just click on them.